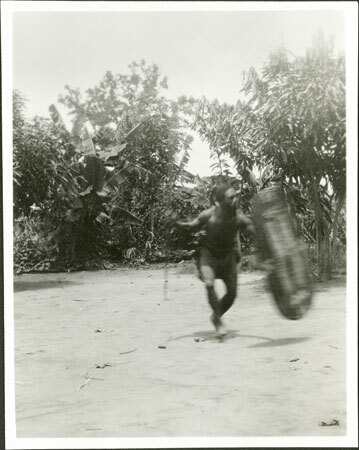 Male warrior demonstrating the use of a wickerwork shield (kube) and spear, in semi-crouched position with shield pushed ahead. Although the use of shields was illegal under British adminstration, Evans-Pritchard had several examples made for him by those who still knew the craft. Morton, Chris. "Zande warrior with shield" Southern Sudan Project (in development). 03 Jan. 2006. Pitt Rivers Museum. <http://southernsudan.prm.ox.ac.uk/details/1998.341.47.2/>.